Pineapple is one of many sweet fruits used in Hawaiian cooking. 3 What Is a Good Lemon After-Dinner Drink? A Hawaiian themed dinner invokes thoughts of luaus with sweet tropical fruits and savory meat dishes. A luau is a feast filled with traditional Hawaiian dishes, such as pit-roasted pig. While you don’t have to throw a luau to have a Hawaiian themed dinner, you do want to include luau-inspired dishes in your menu to invoke that distinct Hawaiian style. Otherwise, your party may end up with a general Polynesian theme instead of a specific Hawaiian one. Pair tropical fruit with other light ingredients to create appetizers that tempt guests' palates without filling anyone up before dinner starts. Sprinkle pineapple spears with lime juice and salt for a tangy starter. Spear precooked shrimp with toothpicks and serve with mango salsa for a spicy appetizer with a complex flavor. Mix diced papaya, macadamia nuts and shredded coconut to create a simple appetizer with a punch of sweet flavor. Pork and seafood are common ingredients in many Hawaiian themed dishes. 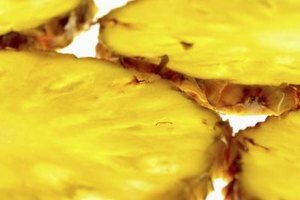 Roast a pork loin rubbed with liquid smoke and serve it with a pineapple and red onion sauce for a savory dish that echoes the taste of a pit-roasted pig. Serve coconut-crusted shrimp with lime salsa or pineapple compote dipping sauce to create a richly flavored meal. Bake whitefish filets in a garlic, breadcrumb and macadamia nut crust for a main dish, or wrap shredded lemon chicken, cooked rice and green onion in green cabbage leaves to create stuffed cabbage rolls with a hint of zip. Light or heavy, there are many side dishes that help bring a Hawaiian themed dinner together. Serve baked sweet potatoes with butter for a classic treat or slice the potatoes into fries and season with red pepper for a spicy side. Mix new potatoes, sweet potatoes, green onions and mayonnaise to create a mellow potato salad with a creamy texture. Toss mixed greens with red onion, green onion, celery, carrots and mango for a sweet garden salad with a tropical twist. Stir watermelon, papaya, mango and strawberries together for a Hawaiian themed fruit salad. Tropical fruits and nuts are the hallmarks of a Hawaiian themed dessert. Bake or buy a coconut cream pie for a classic dessert, or try a macadamia cream pie for a sweet with a subtle flavor. Bake macadamia nut brownies for a traditional dessert with a hint of tropical flavor. Sprinkle papaya spears with brown sugar and grill the spears to create a rich dessert. Serve pineapple upside-down cake with vanilla ice cream for a creamy treat. 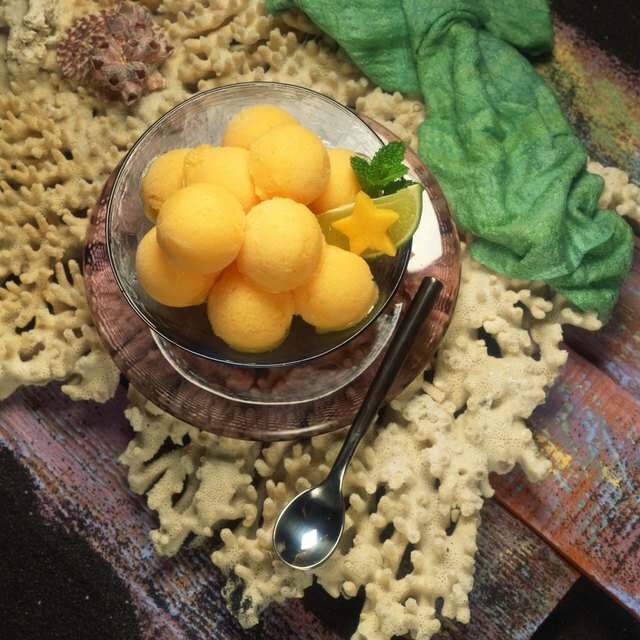 Sprinkle mango sorbet with candied lime rind for a colorful sweet that cools guests down on a hot summer’s eve. What Do You Serve as a Side Dish for Russian Borscht?